You know volatility has been pretty low for a while when an intraday jump to 18.38 in the Cboe Volatility Index (VIX) makes headlines. The VIX, which measures the implied volatility of S&P 500 (SPX) options, tends to move inversely to the SPX, and is a widely watched stock market “fear gauge:” Extremely high VIX readings often go hand-in-hand with sharp market sell-offs, sometimes signaling peaks in bearish sentiment that can accompany market lows. True, 18.38 is the highest the VIX has been since late June, and it’s accompanied the S&P 500’s (SPX) biggest pullback since then, too. But as of Monday, that move was only a 1.4% decline from the October 3 close. And a VIX at 18.38 is a world away from its spike during the February market correction (50.30), and it’s even significantly lower than its readings during the March and April aftershocks (above 25). 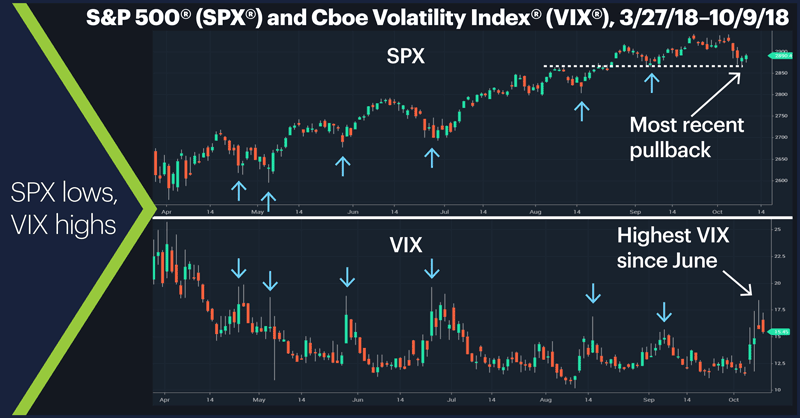 As an armchair observation, the chart above may suggest that if the VIX is “saying” something right now, it’s that the S&P’s latest pullback is “scarier” than the ones in August and September (it is October, after all), but not as scary as the ones in April, May, and June. That said, some traders will likely note that Monday’s low occurred around the support level implied by the September pullback low (horizontal line on chart), which was also the level of the early August swing high, as well as the approximate level of the late-January high the SPX finally climbed above in late August. Basically, it consists of the VIX doing the opposite of what you’d expect it to do when the SPX is making new lows. For example, as the SPX posted its largest daily loss in more than month on June 25, the VIX spiked to 19.61. 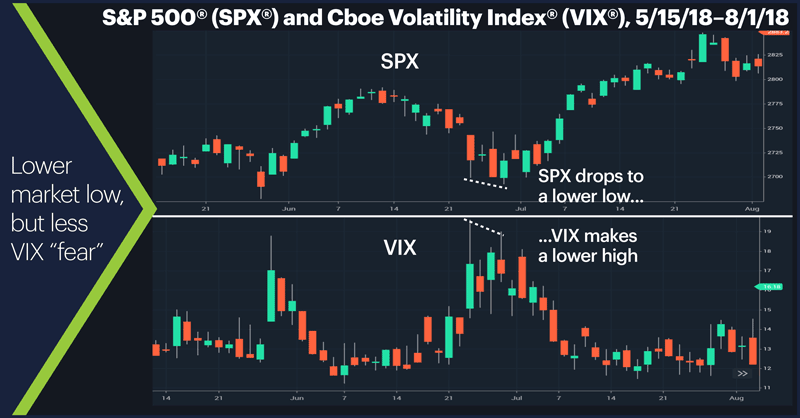 Three days later on June 28 the SPX made a lower low and lower close than it had on June 25, but instead of pushing to a higher high and close, the VIX made a lower low and close, implying the market was registering less “fear” despite having fallen to a new low. June 28 turned out to be the bottom of the move. It’s not foolproof, but if you’re going to listen to the VIX, you need to pay attention to when it’s whispering in your ear as well as when it’s shouting. Market Mover Update: Treasury yields eased slightly yesterday, pulling back to around 3.21% after hitting a new seven-year high above 3.25% earlier in the day. Merck (MRK) outpaced the broad market—and the health care sector—yesterday, rallying more than 1.5% intraday and trading to a new all-time high above $72.50. Today’s numbers (all times ET): Producer Price Index (PPI) 8:30 a.m., Atlanta Fed Business Inflation Expectations (10 a.m.), Wholesale Trade (10 a.m.).